Negligible cross-reactivity with Type I, II, III, IV or VI collagens. Non-specific cross reaction of anti-collagen antibodies with other human serum proteins or non-collagen extracellular matrix proteins is negligible. Full length native protein (purified) corresponding to Collagen V aa 1-1745. Natural Collagen V protein (ab7530) can be used as a positive control in WB. 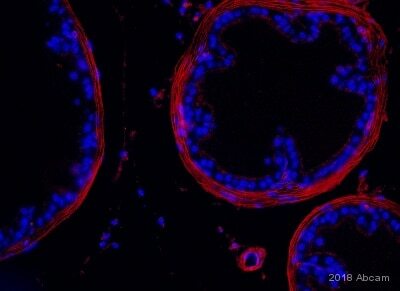 IHC :Dog skeletal muscle tissue, Human pancreas tissue. Some class specific anti-collagens may be specific for three-dimensional epitopes which may result in diminished reactivity with denatured collagen or formalin-fixed, paraffin embedded tissues. Our Abpromise guarantee covers the use of ab7046 in the following tested applications. Sandwich ELISA Use a concentration of 10 µg/ml. Can be used with a suitable biotinylated detection antibody such as Rabbit polyclonal to Collagen V (Biotin) (ab6582). WB 1/5000 - 1/10000. Detects a band of approximately 180 kDa (predicted molecular weight: 180 kDa). Native conditions are recommended. Sulfated on 40% of tyrosines. Additional bands at: 122 kDa, 54 kDa. We are unsure as to the identity of these extra bands. 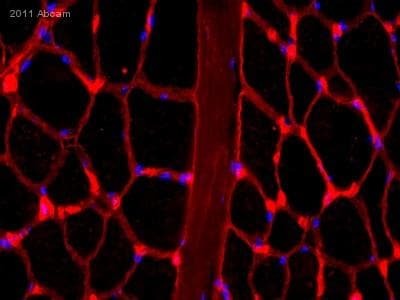 Immunohistochemistry (Formalin/PFA-fixed paraffin-embedded sections) - Anti-Collagen V antibody (ab7046)This image is courtesy of an anonymous Abreview. 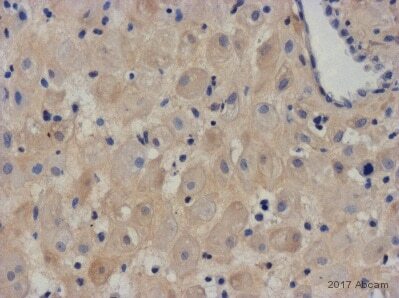 ab7046 staining Collagen V in Human pancreas tissue by Immunohistochemistry (Formalin/PFA-fixed paraffin-embedded tissue sections). The sections were fixed in formaldehyde and subjected to heat-mediated antigen retrieval in citrate pH 6 prior to blocking with 0.25% casein for 5 minutes at 25°C. The primary antibody was diluted 1/75 in Tris--HCL and incubated with the sample for 30 minutes at 25°C. An HRP polymer-conjugated goat anti-rabbit antibody was used as the secondary antibody. Immunohistochemistry (Frozen sections) - Anti-Collagen V antibody (ab7046)This image is courtesy of an anonymous Abreview. 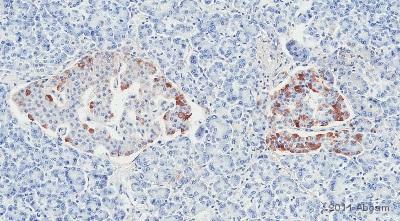 ab7046 staining Collagen V in Dog skeletal muscle tissue by Immunohistochemistry (Frozen sections). The sections were fixed in Acetone. The primary antibody was diluted 1/100 in 10% Normal Goat Serum (ab7481) in PBS-T and incubated with the sample for 12 hours at 4°C. A Rhodamine-conjugated Goat anti-Rabbit IgG was used as the secondary antibody, diluted 1/200. Immunohistochemical analysis of formalin-fixed paraffin-embedded human lung (left) and placenta (right) sections labelling collagen V with ab7046 at a dilution of 1/200 for 45 minutes at room temperature. An antigen retrival step was performed with 0.01 M sodium citrate buffer pH 6.0 at 100ºC for 20 mins. Publishing research using ab7046? Please let us know so that we can cite the reference in this datasheet. Inquiry: could I use your product (ab27478) as a negative control for ab71310 (I am staining paraffin embeded tissues)?. In your web site you claim that rabbit IgG isotype -ab27478 does not react with any antigen could I use it as a negative control for ab100810 and ab7046 as well? 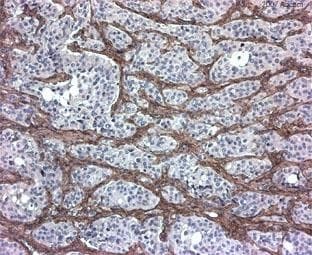 Ab27478 is a suitable isotype control to use with an unconjugated rabbit polyclonal primary antibody, so I would recommend using it as a negative controlfor ab100810 and ab7046 in IHC. As the IgG molecules in ab27478 were collected from rabbit serum prior to any immunization, there is no specificity for any particular antigens. I hope that this information will be useful, but please let me know if you have further questions or if there is anything else that we can do for you, and I'll be happy to help. As a part of my experiment I am comparing breast cancer vs. lymph node metastasis for the expression of: Anti-Collagen V antibody (ab7046) on paraffin embbeded tissues. What positive and negative controls do you recommend to use and how do I obtain them? 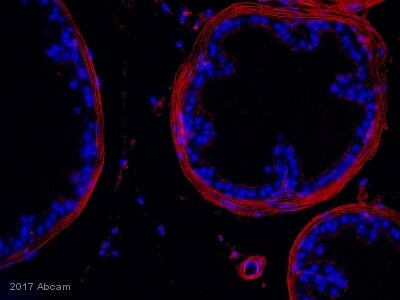 For a positive control for ab7046, you can use human pancreas tissue slides as ab4611. For the negative control, you can use a rabbit IgG isotype control ab27478. And just to you're aware, we're running a promotion through the end of the month where if you purchase 4 products you get the least expensive one for free (4 for the price of 3)! Just mention the code 4FOR4-TB3ME on your order.